Head turning & leg kicking action! Light up Jack O'Lantern & Horse's Eyes! Connects to your Fog Machine for added effects! This is a FUN, QUICK & EASY Halloween Fabric BUSH Cover Dicor - simply place over any bush or shrub and secure with the sewn-on ties. Rain or shine, this quality print, washable & reusable Bush Cover will always look great, with it's water repellent coating and UV protection. This Bush Cover is just one of CTM Holiday Fun Fabric decorations... see our Door Decors, Balcony Banners and other lovable designs ! This is a FUN, QUICK & EASY Halloween Fabric Door Decor - simply place over any size door and secure with the black nylon rope ties included. Rain or shine, this quality print, washable & reusable Door Decor will always look great, with it's water repellent coating and UV protection. This Decor is just one of CTM Holiday Fun Fabric decorations... see our Bush Covers, Balcony Banners and other lovable designs ! Standing 6 ft tall (72 inch), the Decrepit Reaper features a tattered full black robe with gray torn fabric accents, a soft PVC head with moving mouth & light-up eyes, hand-painted roto-PVC hands, and holds a plastic scythe to complete the look. Plug in the UL power adapter into any standard outlet & choose from Steady-On or Infra-Red Sensor activation options to operate. Once activated the pulsing green LEDs within the skull & chest will glow a sickening green, his head will turn from side-to-side and the reaper will say one of three sayings with each activation of the sensor ("You shall know me for the billowing cloud of plague in my wake, for I am pestilence incarnate; approach and seal your doom! ", "Smell the stench of death wrapping around you. I will pull you tightly into my embrace! ", "With just one touch your health and vitality will be sucked from you forever. please, come closer!"). Volume control included. Assembly required. 7.5 ft. Headless Horseman The Legend from Sleepy Hollow is here, and he's looking for his head! 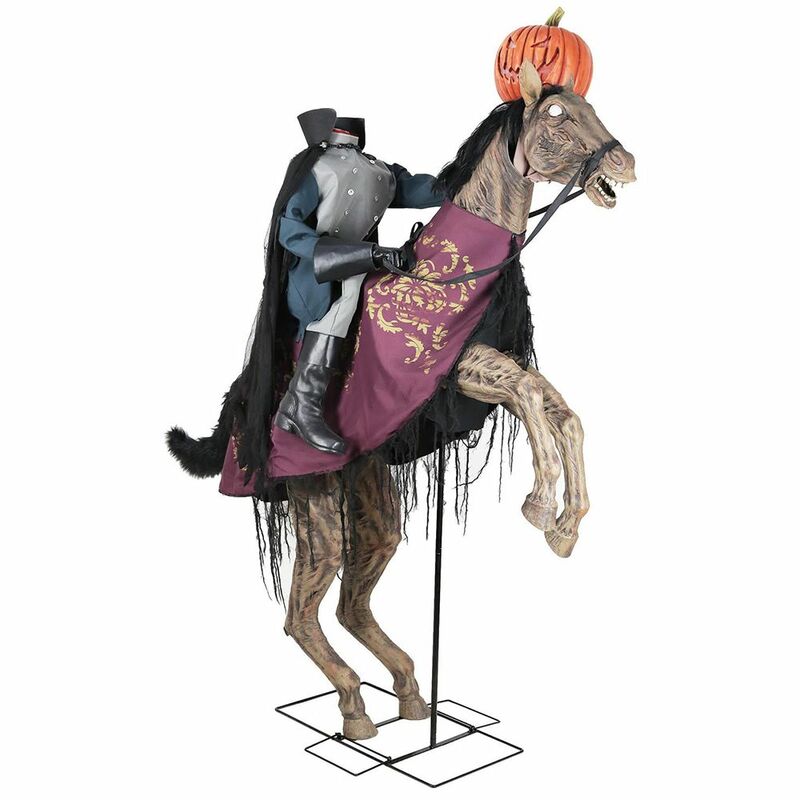 This impressive 6 ft -tall Headless Horseman ,prop is of a headless rider holding a flickering jack o'lantern as he's seated on a rearing horse that kicks its legs and tosses its head! Plug in the UL power adapter into any standard outlet & choose from Steady-On or Infra-Red Sensor activation options to operate. Once activated, the Headless Horseman's jack o'lantern will light up with an other-worldly glow as the horse's legs kick while saying one of five sayings. Also attaches to your fog machine (not included), fog flows in time with horse sounds ! Assembly required. Infrared sensor activation and steady on. Plug-in/UL Listed Adapter. Sound Volume Control. For Indoor Use. Don't lose your head and pick up this prop today! 7.5 ft. Headless Horseman is rated 3.0 out of 5 by 1. Rated 3 out of 5 by Cb40 from Awsome prop but not for outdoors. Bought this, super excited, put it together, put it outside, stood back in awwwh of how awesome it was. Speaker stopped working after it rained, took a better look at the box: This decoration is for covered areas only.